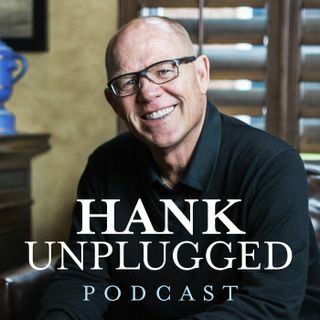 This week, Hank is joined on the Hank Unplugged podcast by one of his absolute best friends, Jack Countryman, and his wife, Marsha Countryman. Jack is a bestselling author that has had an enormous impact in the world of publishing. The two joined Hank on the podcast to discuss the importance of practicing disciplines and the lost art of marriage. If you’ve ever wondered what the key is to living a successful marriage in Christ, you won’t want to miss this conversation. Topics discussed ... See More include: the concept of retirement from Jack’s perspective and how it drives his desire to bring God’s Word to the world (4:30); both men discuss their work in the publishing industry (10:00); the importance of routines and disciplines in life (13:00); the lost art of marriage and building intimacy through investment (16:30); the importance of looking forward as the key to longevity in life (24:30); seeing differences as strengths to build on in a relationship (27:30); Jack’s famous bear story (31:00); discussing Jack’s ministry “In His Grip” and some parallels between principles of golf and Christianity (35:00); prayer as an essential part in finding God’s purpose in our lives (38:30); how Jack’s relationship with his wife has impacted his life and helped him to influence others (45:00); Marsha explains how the Lord brought the two of them together (48:00); the value of handwritten notes in a technological age (54:30); and sharing some of their secrets to a successful marriage (56:30).